Welcome to the August 2018 edition of KHB Ezine. Great news for our visitors as the Kithomebasics site has been upgraded to be a Secure Site using HTTPS protocols. You will now notice when surfing using Google search at the left hand side of the address bar a Lock symbol and the word Secure, showing you are on a secure site. A Red Triangle with the warning 'Not Secure' will be shown if you go to non secure sites. Only those with the Lock symbol are deemed safe to view. Additional, the KHB site had been converted to a modern Responsive Design to assist rapid page loading, and mobile viewing. Buying any product from this site: T Shirts, Ebooks etc is via leading offsite vending systems: Paypal and Clickbank, both using McAfee, Norton and Secure payment safeguards. 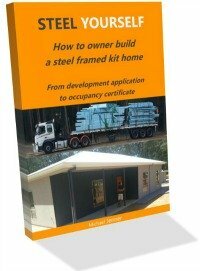 Do you need to look the part on site? Are daggy t-shirts your only option? 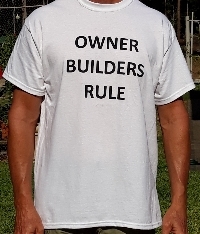 Well, I have just released this one of a kind 'Owner Builder Rules' T ready for you to set the on-site fashion pace. Quality Gildan brand shirts in white in both Large and XLarge.